In today’s highly accessible world there are few places that still hold the power to enthral and enchant. Antarctica is certainly one of these. Mere words cannot do justice to the awe-inspiring spectacle of this most southern of continents, this desert of ice which is so unique and uncommon to man’s experience, that even the most dramatic of photographs pale into insignificance when one is confronted by the sheer magnitude, beauty and wonder of the landscape. For centuries myths abounded of a southern land but early exploration was hindered by the ice. Maps dating back to the late Medieval period show a continent named Terra Australis Incognita, ‘the unknown southern land’. Captain Cook became the first person to cross the Antarctic Circle in 1773 but never sighted land. The first person to set foot on Antarctica is thought to be an American sealer, Captain John Davis in 1821. Since then it is a land that has consistently challenged and inspired men of extraordinary character to deeds requiring extreme courage. The expeditions of Scott, Amundsen, Shackleton, Ross, Byrd and many others are a shining example of honour, strength and perseverance which today still inspire us. We have timed our expedition aboard the MS Island Sky for what is regarded as spring as the pack ice begins to melt. This is the mating season for penguins and other species and you can witness their spectacular displays of courtship ritual, nest building and such antics as stone stealing. This is also the time when fur seals claim their breeding territories. Our voyage begins in Ushuaia from where we will be followed by albatrosses as we sail to the Falkland Islands for our exploration of these isolated islands thriving with wildlife and a fascinating history. We continue to South Georgia where we have ample quality time ashore to explore what is one of the world’s natural wonders with a remarkable concentration of wildlife. We will land on remote beaches, alive with great numbers of fur seals, elephant seals, wandering and sooty albatrosses, Macaroni and king penguins. These beach paradises are backed by some of the most breathtaking mountain scenery in the world. Finally we sail for the peninsula where enormous tabular icebergs rise from the sea, hillsides are covered with thousands of penguins and seals bask on icebergs. 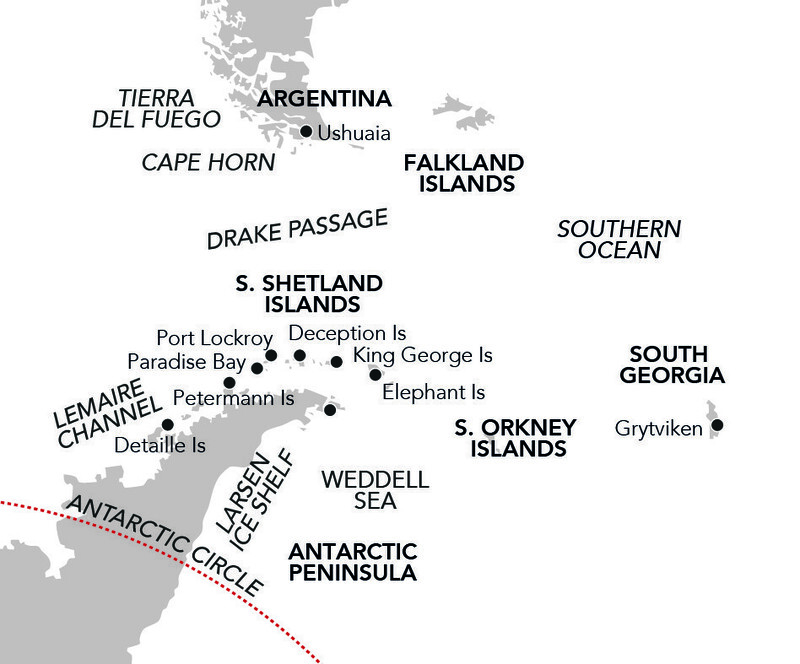 On our way to the Peninsula we hope to sail past Elephant Island, the island on which Shackleton’s men endured 128 days before finally being rescued. Day 1 - Buenos Aires. Arrive this morning and group transfer to our centrally located hotel for an overnight stay. This afternoon is free to relax in the hotel or maybe join an orientation tour of the city including the Plaza de Mayo, the Cathedral and the Cabildo (Old City Hall) before we continue towards the most traditional neighbourhood of Buenos Aires, San Telmo which is characterised by its old colonial houses and the cobblestoned streets. End the tour in La Boca to look around the colourful zinc houses which used to be the refuge and home for the first immigrants and popular artists. The evening is at leisure. Day 2 - Buenos Aires to Ushuaia. After breakfast in the hotel we will transfer to the airport for our scheduled flight to Ushuaia. On arrival, transfer to the MS Island Sky and our adventure begins this evening as we cruise down the Beagle Channel. Among the wildlife spotting opportunities as we sail across the ocean are albatrosses, prions and petrels that frequently follow the ship. Our expedition team will be out on deck looking for whales and dolphins that may also be seen in the area. During our day at sea our onboard experts will begin their presentations with informative and entertaining talks on the wildlife, history and geology of the Falkland Islands and Southern Ocean. Days 4 & 5 - Falkland Islands. The Falkland Islands are isolated, windswept and a haven for wildlife. We hope to land on New Island, the westernmost island with one inhabitant and 40 species of breeding sea birds including rock hopper penguins. Weather and wind conditions allowing, we may also land on Steeple Jason, the north western outpost with the world’s largest colony of black browed albatross, or another nearby island. We also plan to call to Port Stanley, the charming capital of the Falklands and discover some of the historic sites there. Days 6 & 7 - The Southern Ocean. Days 8 to 10 - South Georgia. We have three days of expedition cruising in and around South Georgia, a paradise island with snow-clad mountain peaks rising 9000 feet and with 165 glaciers tumbling down towards the sea. We arrive early in the season when parts of the island are still covered by a thin layer of snow. For anyone interested in wildlife, South Georgia is a true oasis. The beaches will be covered by elephant seal bulls and females with feeding pups. They share the beach with a myriad of nesting king penguins. Most of the other sea birds will have arrived and started to nest. This is also the time when the great arrival of the fur seals starts. Millions of fur seals will, over a few weeks, return to the beaches to breed. During our time here we hope to visit Salisbury Plain where we will find enormous elephant seals which crowd the beaches alongside thousands of pairs of king penguins and whilst in Fortuna Bay we will see nesting light mantled sooty albatrosses and hope to witness their gracious courting flights. A few thousand king penguins nest here. Meanwhile in Grytviken we will visit the old whaling station and of course pay our respect at the grave of ‘the boss’ – Ernest Shackleton. Days 11 & 12 - At sea. Days 13 to 17 - Antarctic Peninsula & South Shetland Islands. We have five days of exploration around the Peninsula and South Shetland Islands which will include many of the best places for wildlife and magnificent scenery. Whilst we arrive with a planned itinerary the final schedule will be determined by our Captain and the Expedition Leader based on sea, weather and ice conditions. Using our Zodiacs we hope to make daily landings or enjoy Zodiac cruises for unique close encounters with animals such as adelie and gentoo penguins, fur seals and petrels. Watch avidly on deck as we approach land or sail though breathtaking channels surrounded by lofty peaks looking down on ice-strewn waters where resting crab-eater or leopard seal can be spotted. En-route South we plan to see Elephant Island with its rocky and inhospitable shore where Shackleton’s crew famously survived. We hope to sail past the collapsed volcanic cone of Deception Island for a chance to visit Whalers Bay, Petermann Island, home to numbers of Adelie penguins, picturesque Neko Harbour, the Lemaire Channel where towering icebergs rise from the sea and Half Moon Island with its rookery of chinstrap penguins. We will also endeavour to sail through the breathtaking Antarctic Sound, also known as ‘iceberg alley’, where massive icebergs drift north from the continent. Days 18 & 19 - Drake Passage. A final two days to relax on board and reminisce with your fellow travellers about all you have seen and experienced during our expedition. Enjoy a lecture, look for wildlife or simply relax as we make our way across the Drakes Passage toward Ushuaia. Named after the 16th century English seaman, Sir Francis Drake, Drakes Passage separates the southernmost tip of South America from Antarctica. This is a particularly good area to spot royal albatross and blue petrel and we will also be on the lookout for pods of sperm whales. Day 20 - Ushuaia to Buenos Aires. Day 21 - Buenos Aires. After breakfast in the hotel, group transfer to the airport to continue with onward travel plans.